Researchers have been testing (their website appears to be under heavy load) a new display that can be embedded into a contact lens and powered wirelessly by a detached energy source. Despite the fantastic possibilities of such a device, it has a long way to go before it ends up in an eyeball near you. For now, the rudimentary display is merely proof of concept. In its current form, the electronics for the device can only manipulate a single pixel. Researchers intend to improve this limitation, however, with a little more time and research. "Our next goal is to incorporate some predetermined text in the contact lens. ", said Lead Researcher, Dr. Parvis. The research paper claims that the wireless power source can be approximately one meter from the device, in line of sight conditions. More interestingly though, a power source may also be embedded into the wearer but the feasible distance decreases dramatically to about two centimeters. The team determined this by using rabbit test subjects and embedding wireless power sources into their heads. With this experimental display, the team surmounted a number of challenges. One of the problems solved was trying to get the human eye to see something mounted on its surface. Typically, eyes need at least a few inches of distance to focus. Integrating circuitry into something as delicate as a contact lens was another issue. Electronics are made from inorganic materials, require high temperatures and contain toxic chemicals which make them difficult to integrate. 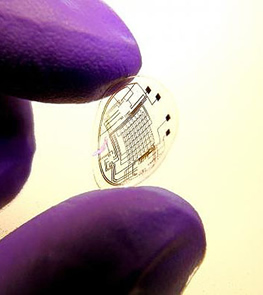 The team found a way to produce extremely thin circuitry and embed it into the contact lens itself. The chips found in the contact lens are built upon a transparent sapphire substrate just nanometers thick. The image itself is produced by a tiny LED which is a fraction of a millimeter across. Researchers are working on adding more chips and more LEDs for multi-pixel version based upon micro-Fresnel lenses. Amongst the potential uses cited, HUD-like functions such as monitoring blood sugar levels for people with diabetes or GPS-based directions for drivers are some pretty nifty ideas. However, those involved with the project admit, "high resolution, full-color, stand-alone contact lens displays might be many years away."